1. 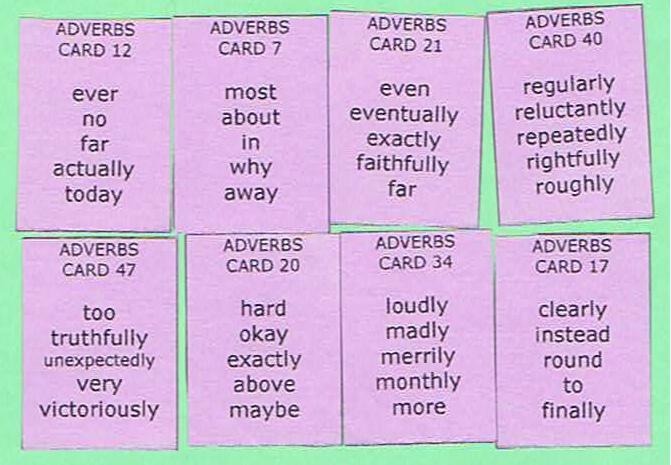 I have (ADVERBS CARD 6) been (ADVERBS CARD 5) before. 2. I met her (ADVERBS CARD 24) on the street. 3. "He (ADVERBS CARD 37) goes to the gym." "Oh, (ADVERBS CARD 8)? I didn't know that." 4. This magazine is issued (ADVERBS CARD 34). 5. (ADVERBS CARD 23), (ADVERBS CARD 12) people were injured in that accident. 6. She is (ADVERBS CARD 47) shy, (ADVERBS CARD 50) she can't make a speech in front of people. 7. (ADVERBS CARD 7) $ 50 is (ADVERBS CARD 50) to buy a fan. 8. Please write (ADVERBS CARD 4) all your answers (ADVERBS CARD 28). 9. (ADVERBS CARD 3) (ADVERBS CARD 6) is this book? 10. He looked at me (ADVERBS CARD 29). 11. She will (ADVERB CARD 15) come on time. 12. He changed his opinion (ADVERB CARD 24). 13. I would (ADVERB CARD 8) go camping than see a movie. 14. We can not (ADVERB CARD 16) say that it is right or wrong. 15. Reiko is looking forward to the festival which is held (ADVERB CARD 25). 16. The day when our dream comes true is still (ADVERB CARD 12) (ADVERB CARD 7). 17. Misa disagreed with the idea, however, (ADVERB CARD 21), she (ADVERB CARD 40) accepted. 18. (ADVERB CARD 47), my score on the test was (ADVERB CARD 20) average. 19. I tried speaking (ADVERB CARD 34), so that everyone could hear me. 20. I was sick, so Masaki gave the presentation (ADVERB CARD 17) of me.